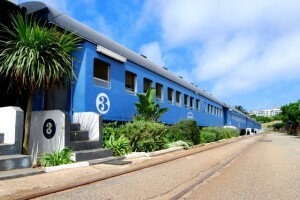 Spending time on train in Mossel Bay doesn’t sound like much fun, does it? I regularly take public transport and spending time being jostled by loud and overzealous commuters is possibly the exact antithesis of relaxation. So when it was suggested that I check out the Santos Express Train Lodge for accommodations in Garden Route, my expectations weren’t high. Thankfully I was pleasantly surprised.